Software is passed of MQl5 loadup test, Please download and enjoy !! 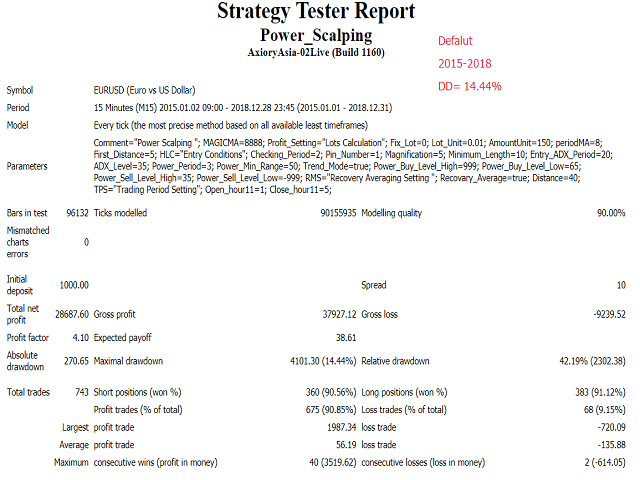 Daily Movement( Called Power) is effects to morning time of Japan Markets , Using this effects with Intelligence Averaging system ,This EA " Power Scalping " is made. If you want to use JPY accounts, Please multiplied by 110 to Amount for Initial Lots like 150*110= 16500.
higher value like 8 to 10 is less entries. Also ADX level is same one. Power Buy Level High i set like a 999.0 to 100.0 also Sell Level Low loke -999.0 to 0.0 are same less entry sets. if you change the Power Min Range like a 50.0 to 30.0 , Entry is much more , but miss entries are increased. Power Periods is calculations for trend direction.. now 3 is much better than others, anyway you can try. If you want to know other parameters , please let me know by comments or private one.